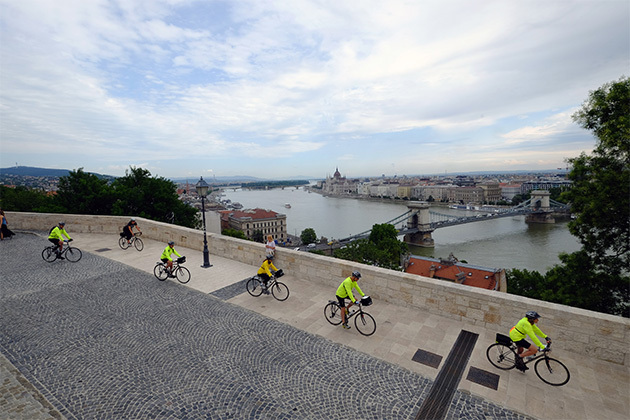 Bicycle touring and river cruising might strike some as strange bedfellows, but tour operator Backroads and cruise line AmaWaterways have teamed up to demonstrate how the two pursuits can make a complementary pair. We dropped our bags onboard the AmaSonata, strapped on a bike helmet and took the bike-cruise concept for a test ride. Think of the Backroads River Cruise as an active land tour superimposed on a traditional river cruise. Yes, you're traveling via ship, but you cover some of the distance on your own power. On most of its departures, Backroads has spots for 30 participants. (The ships accommodate about 160 passengers.) The Backroads group cycles each day (with options in distance and difficulty), and dines together onboard at night. Cyclists are free to indulge in any of the tours and activities offered by the cruise line, but they also get extras, like private small-group city tours and restaurant lunches on some cycling days. The rides are fully supported, with two onboard trip leaders who cycle along, and two ground-crew members in support vans. On the first full day of what Backroads dubs its Danube Cycling Sensation, we gathered under a bridge where the staff had set out our bikes, helmets, GPS devices, bike bags and a table laden with enough fruit, nuts, energy bars and chocolate to fuel a pack of ultra-marathoners. "Today we're in Bavaria. We'll ride into Austria and have lunch at Neuberg Castle above the Inn River. After lunch, we drop into the Passau Valley," announced Kevin, one of the trip leaders. "Oh, and there's a long hill 14 kilometers into the ride. It comes as kind of a shock." It was chilly, gray, rainy. And early. I looked wistfully at the ship, imagining fellow cruisers who would spend a lazy day drifting along the Danube from Vilshofen to Passau, Germany. We, on the other hand, would be covering the 26 miles on our own steam. I willed my jetlagged body onto the bike, and fell into line. And so began a weeklong cruise-bike trip through lush river valleys and forests, past ancient castles and monasteries, through cobbled villages and bustling cities. We visited many of the same landmarks as our cruise mates. But given our extended time on shore, we experienced so much more. Even less-than-cooperative weather didn't dampen the spirits of the cyclists. (Confession: On one particularly dreary morning, I skipped the ride. It's another nice thing about the partnership: If you don't feel like cycling, there are always options onboard.) But when the skies cleared, these two-wheeled excursions were nothing short of joyous. There were imposing sites, like Schloss Hof, a Habsburg estate, farm and palace in the Austrian countryside, where rare species from Baroque times are bred. (Ever seen a white, blue-eyed donkey?) In Austria's Wachau Valley, we cycled through vineyards fringed by pear and apple trees, and through flyspeck villages where fresh apricots and jams are set out for sale on the roadsides. Just leave your payment in the jar. 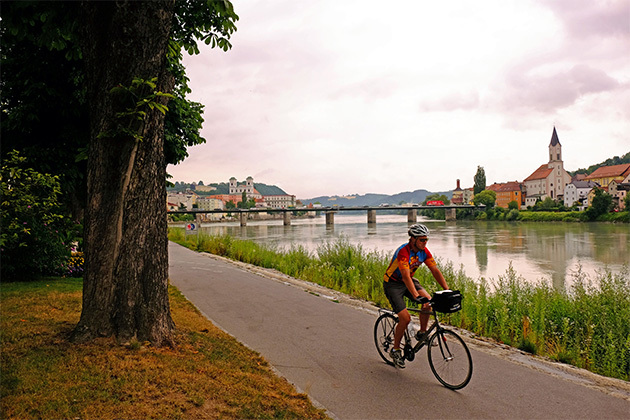 Riding on tranquil paths hugging the Danube on our longest ride -- 46 miles from Vienna to Bratislava, Slovakia -- gave us a close-up look at the still-visible differences between Western Europe and former Soviet-controlled areas. And navigating the thoroughfares of beautiful Budapest with an expert guide, gave even those who'd visited before a new perspective. Backroads' customers pay a premium of $1,100 to $1,500 over the cruise price. 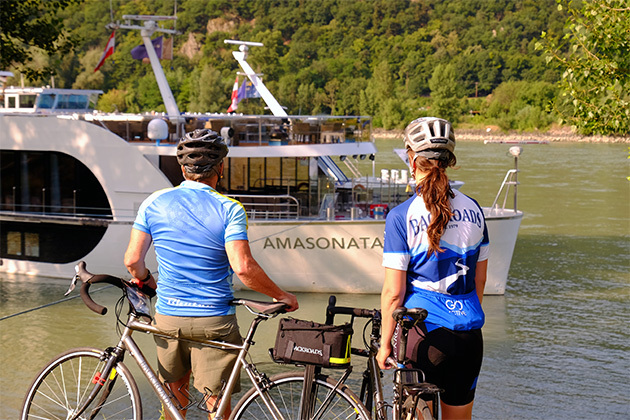 Considering that AmaWaterways' ships have complimentary bikes and helmets, you could do some cycling without paying extra. But Backroads is selling a high-end, high-service experience, and one that has a loyal following. (The active travel company, which also offers hiking and multi-sport trips, says 80 percent of its business is from repeat customers or referrals.) You're paying for professional guides and support services; pre-vetted, detailed routes tailored to various stamina levels; superior bikes custom-fit for riders; and delightful interludes like our stop in the Wachau Valley for trailside wine spritzers and apricot cake, orchestrated by Backroads' ground crew. Guests have an option of requesting e-bikes (a cycle with a motor that kicks in on hills), enabling people of varying physical abilities to participate. Longer, hillier route options are offered most days for more gung-ho cyclists. Those who tucker out early can catch a ride in the never-far-away "sag wagon." Backroads' tariff also includes tips to cruise staff and local guides, plus admission to attractions visited on the cycling tours. Guides even picked up the tabs at a Viennese ice cream shop and an Austrian biergarten we visited. Suggested tips to the Backroads' crew are $28 a day.